Plot: While watching the movie Tango de la Muerte while out shopping with her mother, Lisa becomes enchanted with the art of dancing, and decides to take up the skill. Much to her displeasure, it turns out that the dancing school in town is taught by former child star Little Vicki Valentine, who not only railroads her into the Tap class, but whose technique also contradicts Lisa’s lack of experience… and skill. Concurrent to Lisa’s struggles, Bart and Milhouse have issues of their own, abandoning a camping trip in favor of hanging out in the Mall. “Kill the Alligator and Run” was probably the most stereotypically awful episode of the entire series, or at least, the Scully era. I think it has everything many fans hate about the show’s more contemporary run – Homer’s beyond obnoxious and straight up odious, there’s a gratuitous celebrity cameo, the plot is unfocused at best and nihil at worst, every few seconds contain some form of insanity beyond the show’s universe put into focus instead of a light joke, the satire sucked, the list goes on and on. I don’t know if I can call it the worst episode – “Alone Again, Natura-Diddily” gets more visceral hate from me for completely destroying the show’s soul, and “KTAAR” at least can be almost amusingly bad – but it’s pretty damn clear why it winds up on so many people’s “most hated” lists. (After all, by the time the likes of “Lisa Goes Gaga” aired, the viewership had fractioned.) From this point forward, I am honestly expecting most of the episodes (bar a couple) to be mediocre at best. I hope for the best, but I am more than prepared for the worst. “Only your father can take a part-time job at a smalltown paper, and wind up the target of international assassins!” – Marge Simpson. Don’t worry, ma’am – at least he hasn’t become the enemy of the Federation of Jockeys. Yet. Written by: Al “President for Life of The Simpsons” Jean. Plot: While on a field trip to the Springfield Shopper newspaper, Homer winds up tracing the smell of food back to a food critic’s retirement party. His love of edibles convinces the paper’s manager (played by Ed Asner) to ask him to run a pilot. Unfortunately, he can’t write a good review, so Lisa helps him land the job. While things go well at first with his glowing analysis, he’s pressured to shift to a more critical tone. The lengths he goes in this new style not only alienate Lisa, but lead a mob of restaurant owners to plot his assassination. The art of critique is strange. The cliché “everybody’s a critic” comes from the fact that anybody can look at a work of art and deem it either sublime or subpar. And on the age of the internet, even a dork like me can rant about Steven Universe, and somebody can read it before clicking onto Roger Ebert’s review of My Dinner With Andre. Such is the brilliance of our relatively egalitarian society, as well as the beauty of the internet. But what, exactly, makes a good critic? That’s a question that can only result in subjective responses. If on one hand, you take a critical eye to everything, then you come off as an unpleasable grouch. On the other hand, if you take a positive view of everything, you come off as a sycophant to the show. The latter, personally speaking, is my biggest fear. I’ve criticized Gravity Falls and Steven Universe on occasion, but I sometimes wonder if I was (or am) too loose on occasion because I love(d) the show so much. And many of my early reviews, man… I don’t delete them on the grounds that, hey, we’ve all gotta look back on our early stuff sometimes and wonder how far we’ve come. “C’mon people – this poetry isn’t gonna appreciate itself!” – Bart Simpson, of all people. Drugs – they do weird things. Well, episode 1 of Season 11 was a bust. Next time I want to watch a satire of Mel Gibson, I’ll just throw on that South Park episode where he turns into Daffy Duck and goes full blown Road Warrior because two kids dared criticize his movie. Not even the shifty-eyed dog could save that. Plot: In 2005, in response to developments regarding Anglo-American relations, Neil Tennant and Chris Lowe penned “I’m With Stupid”, a satire on a theoretical romance between British Prime Minister Tony Blair and US President George W Bush. Whoops – this is a television episode… Patrick is afraid that his parents will mock him for being rather stupid. Therefore, SpongeBob decides to take up the role of “The Fool”. Apu’s relationship with Manjula is on the rocks. Apparently, the life of a convenience store manager isn’t exactly conducive to free time. To make it up to her, Apu goes all out in his Valentines Day celebrations. This, though, alienates the wives of Springfield’s men. They all proceed to sabotage the actual Valentines Day celebration. Two years ago (because I am a lazy bum), during my coverage of Season 9, I reviewed “The Two Mrs. Nahasapeemapetilons”. There, my complaint lied in the fact that the episode revolved around Homer’s antics, and was overall rather pedestrian. In hindsight, though, I can recognize some of the character development in that episode, even if I would’ve preferred more. That, and it was a pretty funny episode. Scullyfied Simpsons: Season 9, Episode 13: "The Joy of Sect"
Synopsis: Whilst wasting time at the Airport, Homer and Bart meet two members of the “movementarians”, Glen and Jane. 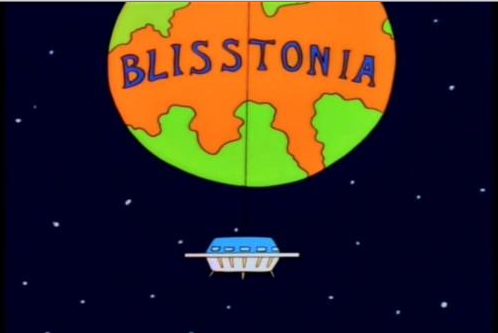 They convince Homer, amongst others, to visit a film, where they promise to use praise to “the Leader” to get “access to a starship to ‘Blisstonia'”. Despite initial difficulties (Homer being too thick, for one), their message manages to get into Homer, and he, alongside most of the rest of Springfield, are sucked into the cult. Said cult forces its members to move to a farm to harvest Lima Beans. The Leader is said to be living in a forbidden barn, building his ship, making brief appearances to wave to the cult members. The cult’s popularity manages to take over Springfield, right down to its media. Only Marge is able to resist the cult, and has to flee the compound to find a way to deprogram the family. Review: FINALLY! After, what, three weak episodes, we finally get an episode that’s… good. Overhyped, though? Maybe a little. This episode’s main strength is in its scathing critique of religious cults. Oh, boy, is it scathing. Take your typical cult tropes and exaggerate them to the nth degree. That’s the Movementarians. Let’s see, all they do is guilt trip people into being brainwashed, take over entire media outlets, poison those into submission, take their member’s money and property, and force them into hard labor… and it’s all just empty. They spend lavishly on themselves, descend the followers into petty fights, enjoy the tax-exempt status of the government to partake in the aforementioned self-serving spending, and pander to the follower’s weaknesses/battle against their strengths. This episode was also very topical, somewhat rare for a post-classic Simpsons episode. You see, this episode has its basis in the Heaven’s Gate cult, which, a year earlier, committed suicide in an attempt to ride Comet Hale-Bopp. Also gaining media attention around this time (I suppose: I don’t have many memories of the 90s) was Scientology (which even had one of its founders write a book that was adapted into a hysterically awful movie), as well as the Unification Church. Of course, it wouldn’t be a Simpsons episode without its characters. For the most part, this episode does well in this regard. In all honesty, this episode shows Marge at one of her high points. It’s not really as high as, say, “Marge on the Lam”, but it’s pretty awesome. Through her, we see her have to take “deprogramming” maneuvers similar to those of brainwashing. It’s a tough call, but sometimes, you have to stoop low to achieve a goal that you know will be heroic in the end. Lovejoy and Flanders are perfect in their role as the Christian holdouts. That, and Ned actually has beer. Maybe I just have traces of ZS on the mind, but that’s a deep, more “average” side to Ned. Willie’s role as the “Id” of the deprogramming operation is perfect. I’ll go as far as to say that, as much as Homer did have some jerkass scenes in the beginning, most of it is excused, as his character is made more realistic by the end of the episode. The twist to deprogram him is awesome, and totally fits in with his character. Complaints? Pacing was a bit off: the airport scene seemed to just be there for a bunch of sitcom jokes, yet the placement of the third act seemed to make it so that said third act dragged a bit. However, it’s an otherwise fantastically funny episode, with wicked satire and good characterization. Enjoy it. These types of episodes will be rare as the years go on. This episode was technically produced by David Mirkin, the showrunner for Seasons 5 and 6. Much like Scully, Dave Mirkin’s twist on the show (especially in Season 5) took it into more outlandish and cartoony territory (“Deep Space Homer”, “Homer and Apu”). Mirkin also took on some social commentary. (“Sideshow Bob Roberts”, “Homer Badman”). However, Mirkin also used more character-based plots, rather than plots that caused the characters to conform to the plot. This episode feels like a Mirkin-era episode… except for art, which is somewhat more rigid. I personally like the twist with the loaner bikes. Goes to remind us that not only are there still holdouts for the cult, but that Our Favorite Family isn’t exactly doing so well. Hear me, Zombie Simpsons? Characters living the high life is not really funny! “We are watching FOX!” I love the “take that’s” at FOX. Jerkass Homer Meter: 2. Most of Homer’s jerkassery is a little justified, but almost mowing down the Movementarians certainly crossed the line. This is also a literal Jerkass Homer Moment: while driving to the Movementarian Center, Homer screams “Outta my way, jerkass!” And thus, a name for the post-classic era Homer was born. Zaniness Meter: 2. The zaniest moment: rover from The Prisoner appears in the barrier between the Movementarian Campground and the town… capturing Moleman. Mmm… I swear I remember that a later episode had a more direct parody on The Prisoner. Favorite Scene: Everything (except the road rage) at the Movementarian Center. Least Favorite Scene: At the airport, Homer is an idiot as to the “free film this weekend” presented by the Movementarians. This joke was done better in “Mr. Lisa Goes to Washington”, with the VIP gag.